We were just told that our child has a hearing loss. What’s the urgency? Why can’t we just enjoy our baby now and deal with the hearing loss later? As much as you would like to just love your child and be a family, these precious first months of life are the time when your baby’s brain is most rapidly changing and developing. Think of a garden that has many tiny plants just peeking out of the soil. What would happen if only some of the plants had water? The plants that were watered would get bigger, bushier and begin to produce flowers or vegetables after a few months. The plants that received very little water would not grow as fast or produce at the same rate or may not ever bear the same size or amount of flowers as the part of the garden that was regularly watered. Similar to a garden being watered regularly, your baby’s brain cells need to be stimulated during all waking hours to grow. The auditory cortex of the brain will not develop typically unless it has consistent stimulation from sound. This is why starting with hearing aids immediately and keeping them on your child during all waking hours is so necessary to his future life if your goal is for him to listen and speak. Even children with very little hearing receive some stimulation from hearing aids, similar to keeping a faucet dripping to prevent freezing during cold temperatures. Children who communicate visually with their families develop rich connections in the visual cortex of the brain. If they also have very limited or no stimulation through the auditory pathways, this ‘real estate’ of the brain will be converted to more visual connections. The time is NOW to support your baby’s brain growth for life, no matter how you choose to communicate! The only WRONG choice is to do nothing! Refer to the materials below for more information. 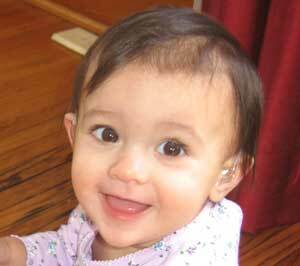 Next Steps: My Child has Permanent Hearing Loss – Now What? – This information is for families who are trying to face the ‘next steps’ after finding out their child has hearing loss. It briefly touches on feelings, finding help and why it is important not to wait to act. 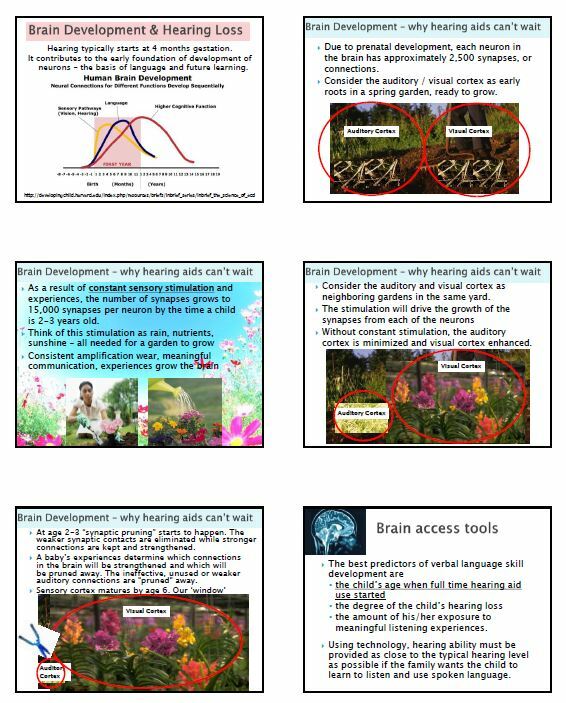 Brain Growth & Hearing: Summary of how hearing loss impacts brain development handout: Brain Development & Hearing Loss– Whether your child has permanent hearing loss, hearing loss in just one ear, or hearing loss due to many ear infections – unless you act quickly his brain development may be affected. 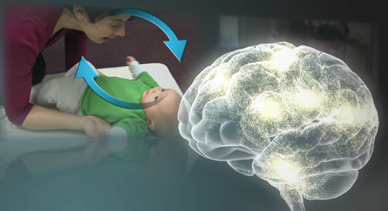 This information breaks down what happens in early brain development and how hearing loss can effect it. This handout on brain development from Harvard University is also a good resource. Choices for families: HEARING AIDS – What, When, Why, How – A quick rundown on hearing aids and family choices.